In 1964 the Beatles conquered the world. 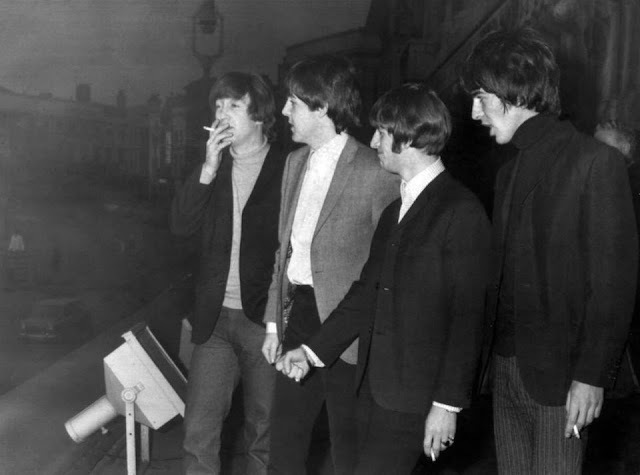 In January they visited Paris, in February America and through the remainder of that month and into March and April they made their first movie 'A Hard Day's Night' and recorded the soundtrack album. After a brief spring tour of the UK and a couple of weeks holiday they were off again playing in Denmark, Holland, Hong Kong, Australia and New Zealand. Then came the big one, an exhausting month long tour of North America and Canada taking in 24 cities. Their final date was on 20 September after which they returned to the UK and began recording what would become the 'Beatles For Sale' album. They had to work fast and grab studio sessions where they could because within a fortnight they were back out on the road again. 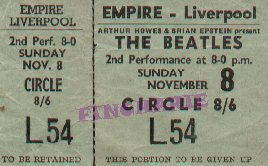 The Fabs' Autumn 1964 UK tour was a joint production by their manager, Brian Epstein and Arthur Howes, the promoter who had been early to spot the Beatles’ potential. After watching them on stage at the Embassy Theatre in Peterborough on 2 December 1962 he quickly added them to his package tours in the early months of 1963 and, as a thank you, Epstein granted him first option on each successive UK tour. 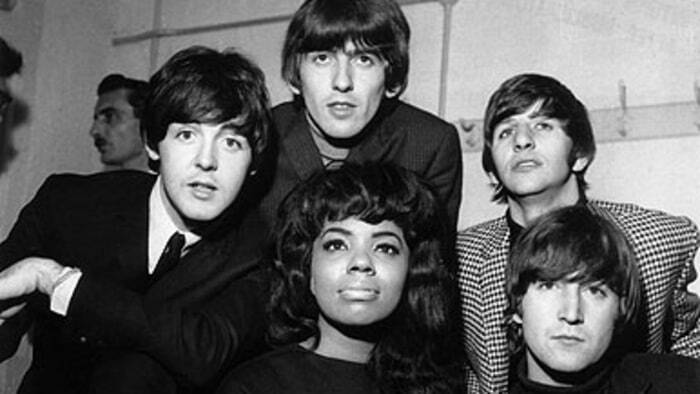 The Beatles played two 'houses' at 5.40pm and 8.00 pm and received around £850 a night (about £13,000 today), considerably more than the supporting acts on the tour who included Motown star Mary Wells backed by Sounds Incorportated, Tommy Quickly backed by the Remo Four, The Rustiks (from Paignton, Devon) and Michael Haslam (from Bolton). 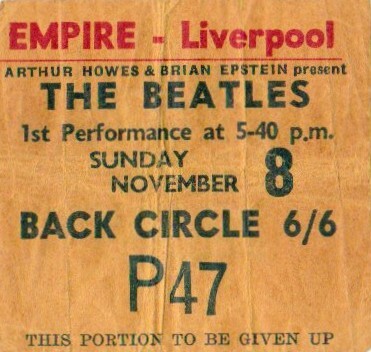 With the exception of Wells, all of the acts were part of Brian Epstein’s stable. 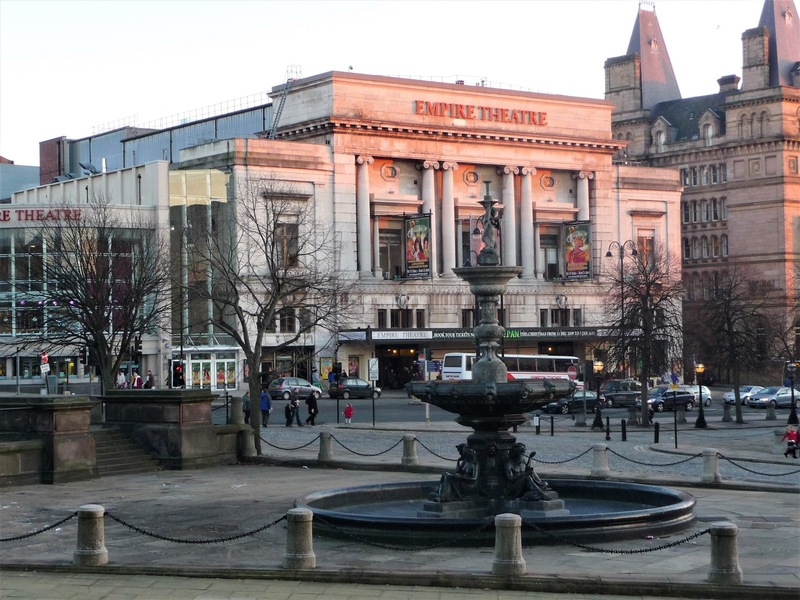 Starting in Bradford on 9 October and taking in towns and cities throughout the UK including Exeter, Leeds, Glasgow and Belfast, the 25th date of tour was a return to their hometown, Liverpool, their first concert appearance in the city since 22 December 1963. 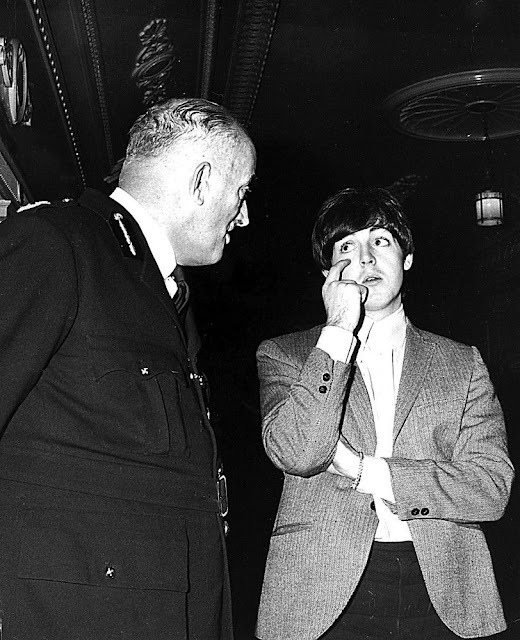 A new chauffeur – Alf Bicknell – had been hired to drive the Beatles in their Austin Princess between engagements and they arrived late at the Empire, thick fog delaying their journey up from Cardiff, the scene of the previous evening’s outbreak of British Beatlemania. The fans were out in force, approximately 1000 gathering on the St George’s Hall side of Lime Street bringing traffic outside the Empire to a halt when they charged across to get a better look when the Beatles walked out on to the balcony to wave at the crowd. The police soon ordered them inside save any of the fans below be hit by a car. 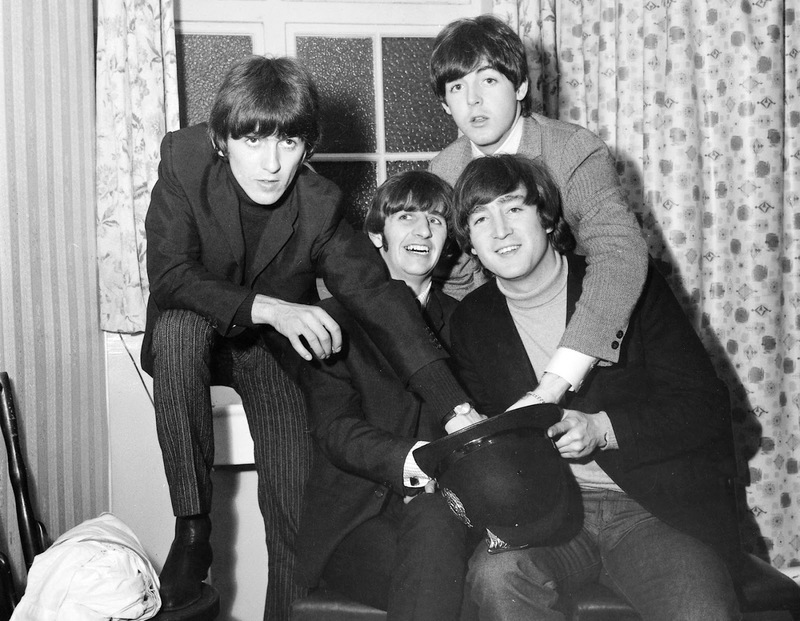 In between the two shows the Beatles ate their dinner (reportedly steak, chips and peas) in the Empire’s dressing room, met the press, posed for photographs and socialised with old friends and family. At the press reception the group was asked how often they had the opportunity to return to Liverpool and Paul, ever the diplomat admitted that it was more often than people thought. 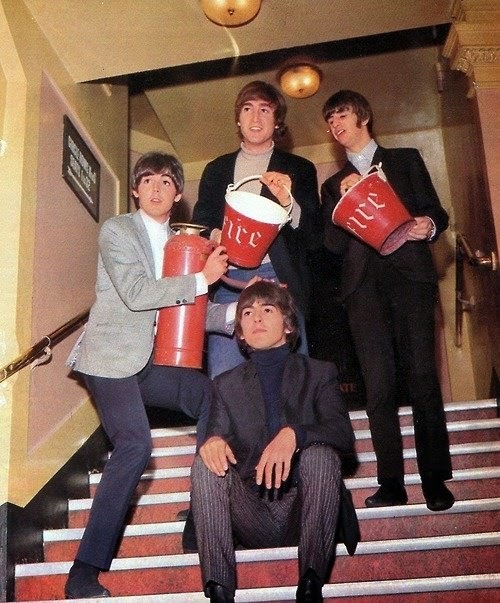 Backstage the Beatles posed for photos messing about with fire buckets, and pretending to douse George. ...and had time to draw out the lucky winnng ticket from a policeman’s helmet. Backstage they met with Bill and Virginia Harry, the Cavern owner Ray McFall and DJ Bob Wooler, Paul’s dad Jim and one of John’s cousins. 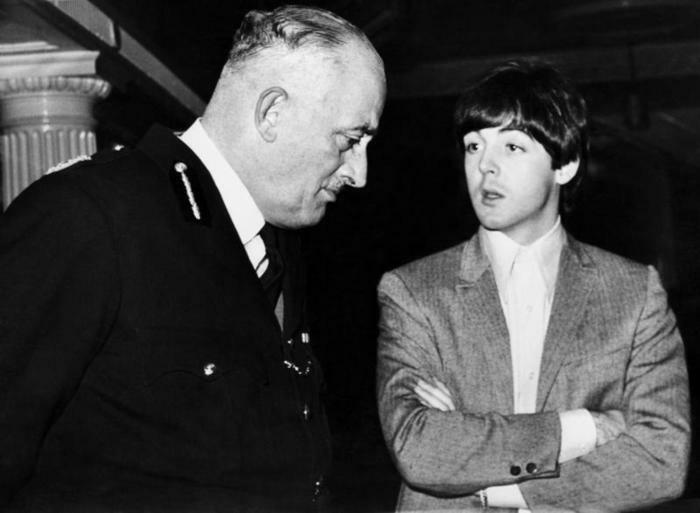 John and Paul reportedly spent time with Harry Walley, the intimidating policeman father of John's childhood mate (and first manager of the Quarry Men) Nigel, who was charged with getting the Beatles in and out of the Empire safely. 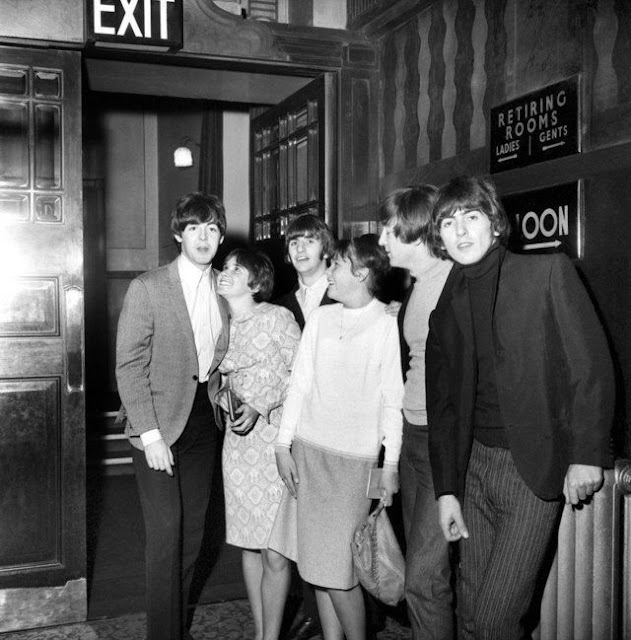 While fans congregated around the stage door at the rear of the theatre the Beatles snuck in through a side door, almost unrecognised. 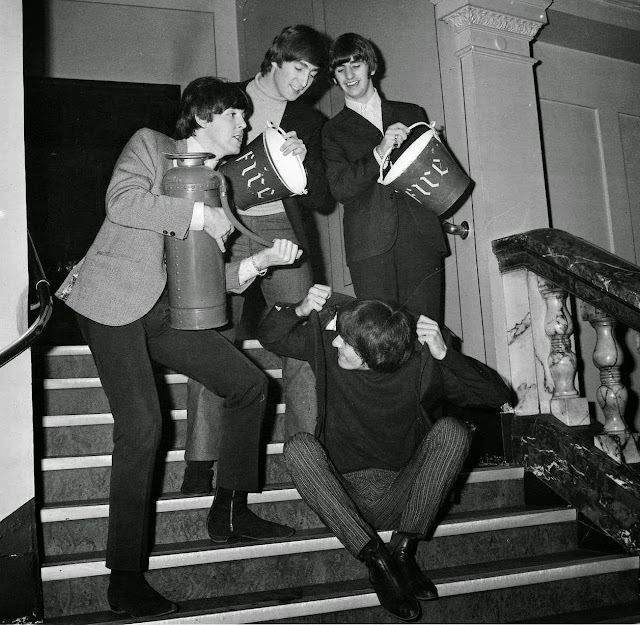 There had been some reports in the press during this tour that audiences in certain parts of the UK had not been as hysterical as they had in 1963. 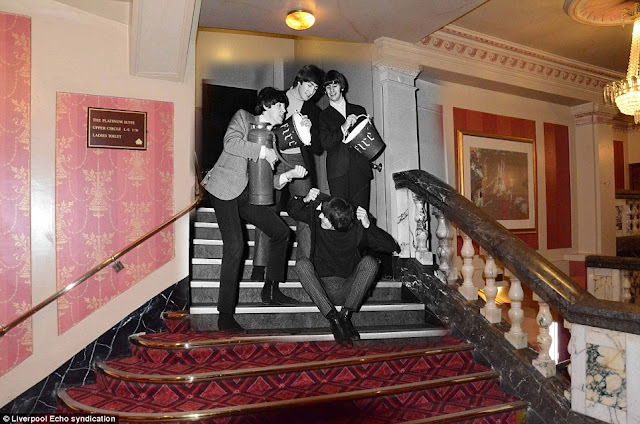 However, there was no sign that Beatlemania was on the wane in their hometown, the 65 strong St John’s ambulance team later commenting that while they only had to deal with two fainters in the first house, there were 22 in the later one. Mike Gerrard and his friend Bill Morton attended: We had seats a few rows from the back in the stalls. It was a good show, especially seeing someone like Mary Wells. Seeing an American singer live on stage was quite something. But when the Beatles were introduced it was mayhem. The vast majority of the audience were teenage and pre-teen girls, there weren’t many boys like us, and not many adults either. The noise was deafening, this really loud screaming an shrieking. It was loud all the way, but when the Beatles did something like shake their heads, it was absolutely deafening. You could hear their instruments but you couldn’t hear the voices at all. It was hard to tell what number they were doing, but I do remember ‘Twist and Shout’. You couldn’t mistake the intro to that. As did Anne Marshall: There was a big queue outside and up Lord Nelson Street. (Due to may age) I missed the Cavern days so they were already famous. I just remember the excitement, but screaming spoilt it for me (not my screaming). My brother knew lots about them. Older than me and went to the Cavern. I was at the age I would rather have danced to the music. After the two houses, John and Bill Harry, accompanied by Pete Shotton went to visit Stuart Sutcliffe’s family. Bill Harry recalls: Virginia and I went to the Empire and joined the Beatles in their dressing room. I told John that he hadn't seen Millie Sutcliffe since Stuart had died. Virginia and I dragged him – along with Pete Shotton - to Millie's house in Sefton Park after the gig and she was delighted. So was John. Millie returned a 'How To Draw Horses' book he'd lent Stu, a clipping from a Birkenhead paper when they were first named the Beatles in an advert and she also invited John and I to pick any of Stuart's works we wished. She took us round the halls and bedrooms of the flat showing us the work. John picked a blue abstract oil painting and I picked a collage Stuart had done in Hamburg - and it has always remained on display in a room in our home, reminding me almost every day of my lost friend Stu. The Beatles stayed with their respective parents that night – John with Mimi at Mendips, Paul in Forthlin Road, George in Mackets Lane and Ringo in Admiral Grove. 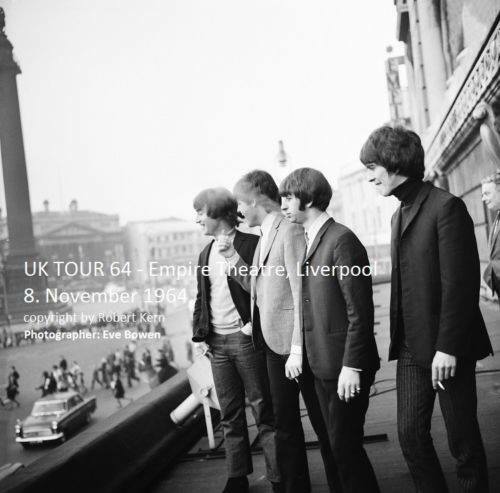 They would play in Liverpool one final time on 5 December 1965. The following two photographs turned up on Sara Schmidt's wonderful blog 'Meet The Beatles For Real' (http://www.meetthebeatlesforreal.com/). In trying to identify the policeman I made an interesting connection. 8 November 1964: Paul chats with Joseph Wright Teesdale Smith, the Chief constable of Liverpool before the Beatles' performance at the Liverpool Empire during the 1964 UK Autumn Tour. Joseph Wright Teesdale Smith was appointed Chief Constable of Liverpool City Police in 1958. 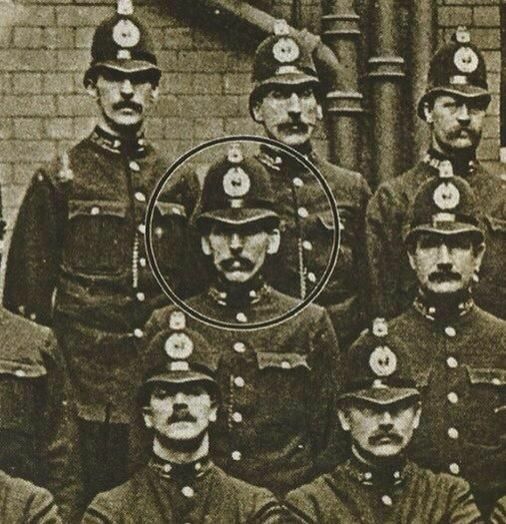 During the Police Strike of 1919 Smith served as a Constable in Liverpool City Police and was one of the many Officers who went on strike, including George Harrison's maternal grandfather John French. The Watch Committee at their meeting unaminously decided that any member of the Force now absent without leave who fails to return to duty immediately or fails to parade at his Divisional Station for orders before 8 p.m. this first day of August, 1919, is dismissed and will not be permitted to rejoin the Force. Smith was one of the officers who did report for duty and was not dismissed. John French did not, and was. George Harrison's grandfather John French before he was sacked during the Police Strike in 1919. As somebody once said, 'the resemblance is truly striking'. Bill Harry's recollection of taking John to see Millie Sutcliffe is a compilation of comments made on his Facebook page.